Learn how to recognize sensory processing disorder (SPD) and other related symptoms, such as vestibular and/or olfactory dysfunction. SPD is the inability to properly perceive and interpret information from the senses in a way that affects daily functioning. 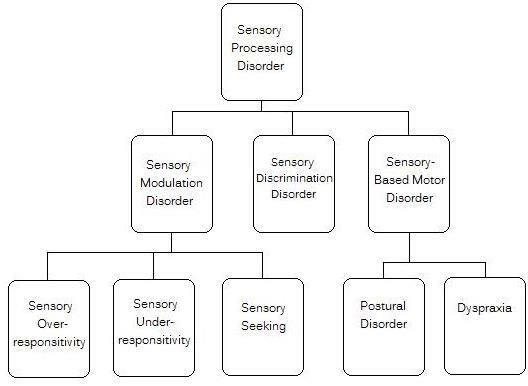 Previously referred to as Sensory Integration Dysfunction, it encompasses a variety of neurological disorders in children and is not just one specific condition. SPD can cause the individual affected to display atypical behaviors and may sometimes be confused with symptoms of mild autism, ADHD symptoms or even asperger syndrome. Making sure to get a correct diagnosis is important since the treatments can be very different for all of these disorders. Sensory Modulation Disorder is suspected when a child shows difficulties with processing that are high in frequency, intensity, and duration. This means that the signs or unusual behaviors occur several times a day, with fixed avoidance or fierce efforts to contact environmental stimuli, and lasts several minutes or longer. A child may become over-responsive to stimuli in the environment or under-responsive to stimuli when there are processing difficulties. Other children may primarily be sensory seeking or have a mixture of over-responsive and under-responsive sensory disorder symptoms. As a subtype of SPD and sensory modulation disorder, this is the category that is most often confused with signs of ADHD, especially since the two can coexist. Despite having similar symptoms, the causes are very different as well as the treatments. Typical ADHD medications will not eliminate symptoms and might even aggravate them. A trained occupational therapist in sensory integration will be able to recognize the difference. Children with sensory processing disorders can have a different combination of signs depending on the type of SPD that affects the child. One or more of the senses can be affected and one may be affected more than another depending on how that particular child's brain is processing information. For some children they may primarily have vestibular dysfunction and another child may primarily have tactile defensiveness. This can be very confusing for parents and make it even more difficult to detect signs of the disorder. Learn the wide range of symptoms by clicking on the link above. Treatment options vary depending on the type of symptoms a child is displaying. Interventions are generally determined by an occupational therapist trained in sensory integration. They may include the use of a sensory diet, therapeutic listening, and/or the Wilbarger brushing protocol to help the child with processing information. The autism products page has some great resources for help with sensory activities based on a particular sense. My son was diagnosed with SPD shortly after his 3rd birthday, sensory seeking subtype. We have done the Wilbarger brushing protocol and therapeutic listening with him. Both helped him immensely to be able to focus and sleep better. Therapeutic listening also made a huge difference in his speech, which was somewhat disconnected at the time due to difficulties processing auditory stimuli. Currently, his language is outstanding and he has made huge improvements in all areas academically. Most of his sensory integration activities at this time include normal daily activities, such as riding a bike and playing sports. This treatment involves a specific method of brushing the body in a way that provides a proprioceptive massage. It is good for calming, improving sleep quality, and helping with speech. It should only be taught and supervised by a trained occupational therapist to avoid any adverse reactions. You can read more about this type of treatment by clicking the link above. Although this disorder has earned a name all of its own, it is really a more specific type of sensory processing disorder that focuses on the central auditory system. Interpreting and processing auditory stimuli appears to be the greatest indicators and what affects daily functioning the most, but there are usually additional signs of SPD in other senses as well. They may not be as noticeable, but are typically present. 1. Kranowitz, C. S. (2005). The Out-of-Sync Child: Recognizing and Coping with Sensory Processing Disorders. New York, NY: Penguin Group.